Another major weather event is upon us, and while it’s not quite as strong as the hurricane that wiped out sections of New York City and New Jersey last week, it’s nothing to sniff at. “Mother Nature is not cutting us a break along the East Coast,” said Tom Niziol of the Weather Channel. “It’s not a massive nor’easter by winter standards, but at this time of year immediately after Sandy’s wrath and destruction, this isn’t what we want.” Rain, snow, and winds of up to 60 mph are expected, with preparations including the closure of New York City parks, playgrounds, and construction sites through Thursday morning, as well as the evacuation of 600 nursing home residents in the Rockaways. A potential storm surge in already flooded areas seems likely, and for victims of Sandy — many of whom are still without power or even homes — the low temperatures are no fun either. Update: As of Wednesday afternoon, the wind is alive and snow is falling in parts of New York, New Jersey, and up the northeastern coast. The storm has been unofficially dubbed Athena, and has resulted in the cancellation of more than 1,500 flights through tomorrow. Up to 12 inches of snow could be dropped on already flooded areas, while the wind threatens to blow around “the debris that’s been piled up from all the residences and the businesses waiting to be picked up and collected,” according to Point Pleasant police chief Kevin O’Hara. 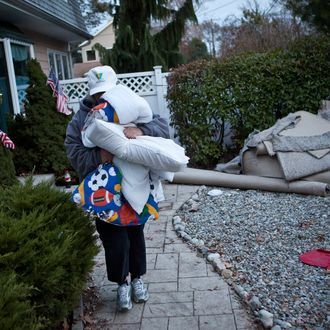 Update II: “By about 5 p.m., the winter storm had knocked out electricity to about 11,000 Con Edison customers in New York City and Westchester County, at least a few of whom had just gotten it back after Hurricane Sandy tore through the region,” the Times reports. That brings the day’s total to 75,000 Con Edison customers without power, and over 1 million in the last ten days.